The asphyxiation-blue plastic of my dash looked like it would snap under a crass tone. The line between cleverness and idiocy is a blurry one. 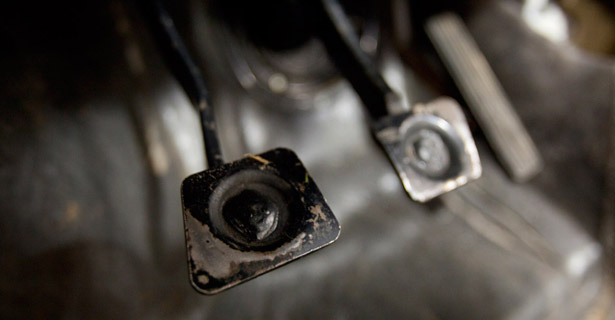 After reading a number of write-ups on the best way to swap pedal boxes in a Fox Body Ford Mustang, I decided to eschew common wisdom and blaze a new trail of my own. 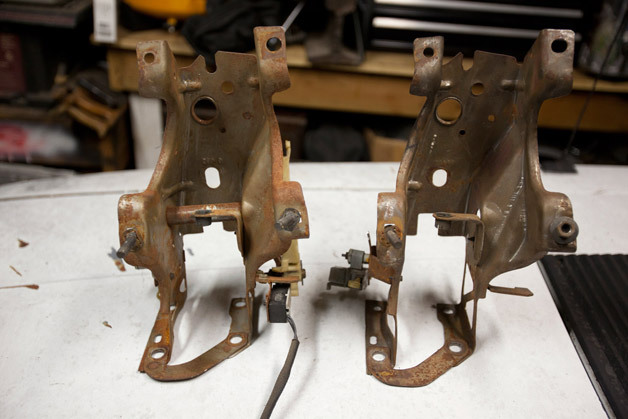 Traditionally, putting three pedals where once there were two involves pulling the entirety of the ancient plastic dash from the vehicle in order to gain access to a few carefully hidden nuts and bolts. Undo some linkages, pull said hardware, reverse the process and voilà! You suddenly have a portion of the controls necessary to row your own gears. It was pulling the dash on Project Ugly Horse that had me sweating. The asphyxiation-blue plastic of my dash looked like it would snap under a crass tone, so rather than go all hog wild with the ratchet, I took a closer look at the construction of both pedal boxes. From what I could spy with my little eyes, the swap could be accomplished with a little ingenuity, some sweat and a few well-placed curses. I busted out the grinder, set the welder to warm and got busy. Every walkthrough I had read warned against pulling those bits apart with all of the seriousness of caution labels on a box of Ebola. In reality, the two boxes are only differentiated by the presence of a metal tube that houses the clutch pedal shaft on manual transmission cars. There are two manual boxes pictured above, one with the clutch tube removed on the right and one with it in place on the left. I pulled the brake and clutch pedal from the donor box, ground off the flimsy welds that held the tube in place and installed the cannibalized pieces in the Mustang with my own flimsy welds. 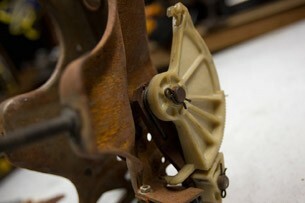 This process involved disassembling the plastic clutch quadrant on the right of the box. Every walkthrough I had read on the pedal box swap warned against pulling those bits apart with all of the seriousness of the caution labels on a box of Ebola, but since I planned to replace the brittle plastic with a shiny billet aluminum adjustable quadrant, I wasn't as worried about popping the spring-loaded nightmare apart. With the pedals and aluminum quadrant in place, I routed a salvage clutch cable through the firewall via my new firewall cable adjuster and under the car, where I attached a set of junkyard linkages to the shift fork. That's when I noticed a problem with my set up. Had I read those Ebola warnings a little more closely, I would have noticed the OEM quadrant is crucial for keeping the clutch pedal taut against the cable. Without it, the pedal flops around like a despondent pool noodle, wandering up under the dash and generally being useless for changing gears. With a little head scratching, I worked up a system using one of the old springs to retain pressure on the cable and keep the pedal down where it should be. That left me with just one missing piece of the puzzle: the shifter. You see, the T5 transmission had not come with a shifter of any variety, leaving me with a big hole in the trans tunnel and nothing to fill it with. Time for a confession: One of my motivating factors behind jumping into pony car waters was the chance to play with some of the storied brands from the American aftermarket scene. I'd grown up surrounded by names like Crane Cams, Moser Axles, Edelbrock, Holley, Moon and Hurst, but my personal automotive tastes had, for years, taken me far from the territories occupied by those companies. I couldn't pass up the chance to lay my palm on a genuine Hurst cue ball. With a set of Mustang keys in my pocket, that all changed. When it came to the shifter, there were plenty of short-throw options to be had, but I couldn't pass up the chance to lay my palm on a genuine Hurst cue ball. Blame it on years of prowling local auto shows and peeping through driver's side windows, eying the ivory-white of a four-on-the-floor and dreaming of first-to-second slams, so any other shifter simply wouldn't do. On a whim, I reached out to Hurst to see if they wanted to be a part of the Ugly Horse build, and by what I can only attribute to a clerical error, they agreed to send over a Billet/Plus shifter for the T5. They bill the part as serving up reduced shifter throw as well as tricks like adjustable shift stops and a billet aluminum base. 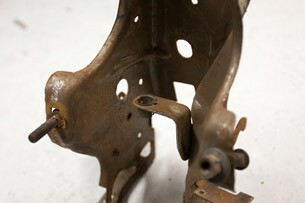 Of course, just about anything offers better feel and reduced throw over the old Ford parts. Gear selection in a stock GT of the Ugly Horse's era feels more like stirring a pot of half-done spaghetti with a bundle of pipe cleaners than knocking cogs. When I can't sleep, I'll sit in the driver's seat and click from first through fifth. Installation was incredibly simple with the interior out of the car, though since the chassis originally played host to an automatic gearbox, I had to trim the sheetmetal back a bit to make room for the taller manual shift base – something I would have had to do even with stock parts. Following the instructions, I torqued the four bolts down with the included gasket and I suddenly had one very nice bit of kit in the cabin. 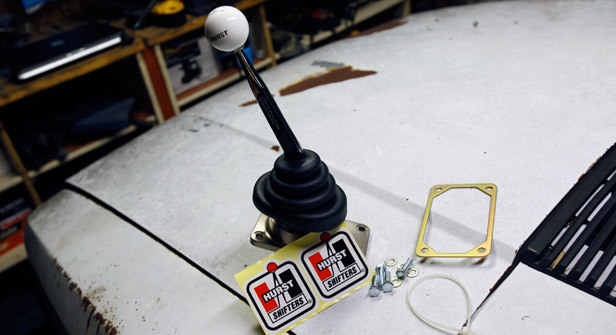 The shifter sits at a nice height and is easy to reach from the steering wheel, but there's no calling the throws short. It's a lengthy jump from first to second gear or second to third. Fortunately, the stiff springs immediately snap the lever to neutral, and popping through gears serves up a satisfying metal *thunk* with each row. Sometimes, when I can't sleep, I'll sit in the driver's seat and click from first through fifth. It's magic, but I get strange looks from my wife. For $245.66, you can grab one for yourself here. With the automatic transmission officially expunged from the car, I can turn my attention to more pressing matters like ditching the four-lug hubs and wimpy brakes for something with a little more bite. Stay tuned.